What are the top landmarks in New York? Offering blissful respite from Manhattan’s concrete jungle, this is the perfect spot to rest weary feet or enjoy a picnic. New York’s infamous neon wonderland is hustle and bustle at its best, and an essential stop for all tourists. One of Manhattan’s most iconic developments, this hub of business and entertainment was considered a remarkable feat when it was completed in the late 1930s. No trip to New York is complete without zooming up the top of this iconic building, where the views of Manhattan are unmatchable. This symbol of freedom, democracy and hope is one of the most famous statues in the world. Whether you’re performing here, watching your favorite sports team or entertainer or touring the venue, you’re in for an exciting event. One of the most recognizable areas in the world also has enough tourist attractions to fill several visits. This fashionable neighborhood is great for shopping, eating and drinking. Manhattan’s prized arts district is a success story of urban renewal. Tour the area to see some of Downtown’s hippest attractions. Stroll along quiet residential streets, visit two large parks and enjoy some of the world’s most renowned cultural attractions in this Manhattan neighborhood. Once the center of New York’s bohemian art scene, this area remains one of the city’s best hangouts and a great spot to sip an espresso or catch an independent film. 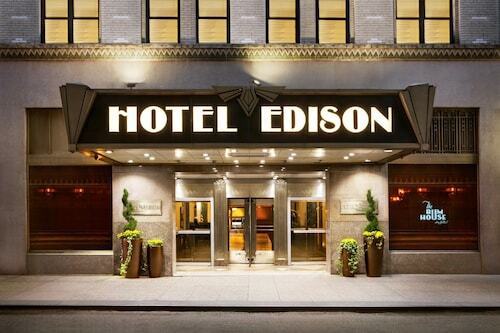 Discover the charm of what was once one of New York’s most notorious neighborhoods. 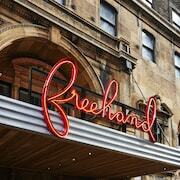 Today it has a village vibe, a flourishing arts scene and great restaurants. It is a very good location to access the subway system of New York. We loved being so close to all the things we wanted to do and see in New York. I enjoyed my staying and definitely use it again next time I come to New York. 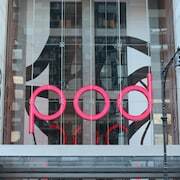 This was my 3rd time to New York, all at different hotels around Rockefeller and Times Square and I would recommend this to anyone anytime. 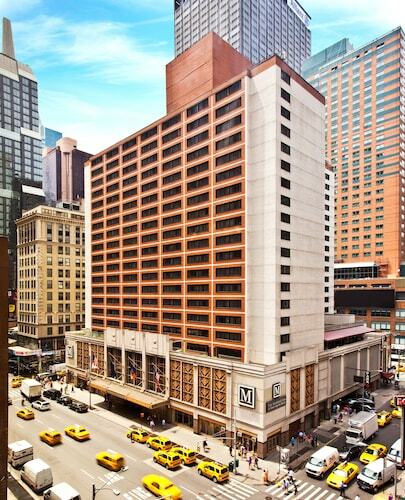 We booked at the Manhattan at Times Square because of its proximity to everything we wanted to see in New York. My husband and I went to New York for a quick getaway and we love old school hip hop and a bunch of bars by the hotel played our kind of music. Summer solstice in New York City. Opens in a new window. Very classy lobby and reception old school. Rooms spacious and spotless. Only down side no coffee making facilities. Location outstanding. If you are choosing where to base yourself in or around New York, there is a wide range of options to choose from. 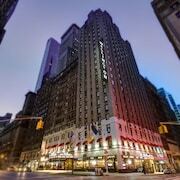 You'll find 765 hotels within 0.1 kilometres (0.06 miles) of New York's downtown on Expedia's informative and up-to-date booking section. 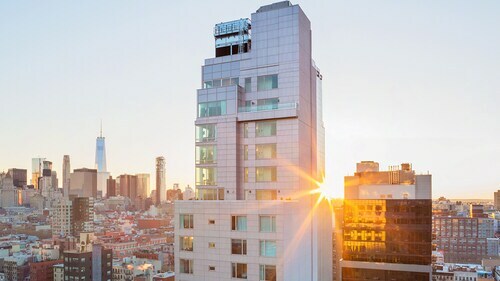 A key to stress-free traveling is finding a hotel that's close to the action, so have a look at the Langham Place, New York, Fifth Avenue and WestHouse New York, all of which are located within 1 kilometre (0.6 miles) of New York's city center. The popular neighborhood of Manhattan offers 517 hotels and apartments. Manhattan is 3 kilometres (2 miles) from the heart of New York and is one of the more commonly visited hotel districts. 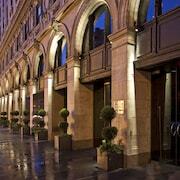 In Manhattan, the The St. Regis New York and Mandarin Oriental, New York are among the choices. Travelers will also find some comfortable places to base themselves in Queens. This accommodation neighborhood is 16 kilometres (10 miles) from the center of New York. 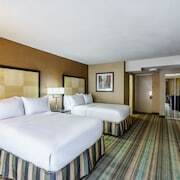 Queens's more well-known establishments include the Sheraton LaGuardia East Hotel and Courtyard by Marriott New York JFK Airport. You can also find a place to stay in Jamaica, which is where you'll find the Hilton New York JFK Airport and Radisson Hotel JFK Airport, and Astoria, which is home to the Fairfield Inn by Marriott New York LaGuardia Airport/Astoria and Super 8 Long Island City, LGA Hotel. Hell's Kitchen is 1 kilometre (1 mile) from New York's downtown, while West Village is 3 kilometres (2 miles) from the middle of New York. 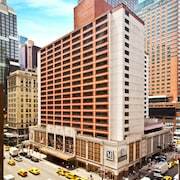 The InterContinental - New York Times Square and Homewood Suites New York/Midtown Manhattan Times Square are situated in Hell's Kitchen, while The Jane Hotel and MySuites are in West Village. New York is known for the Statue of Liberty. 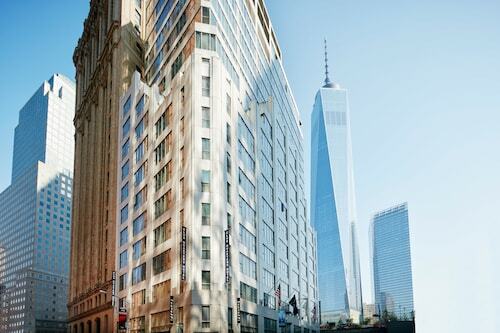 The Trump Soho New York and The James New York are all nearby. 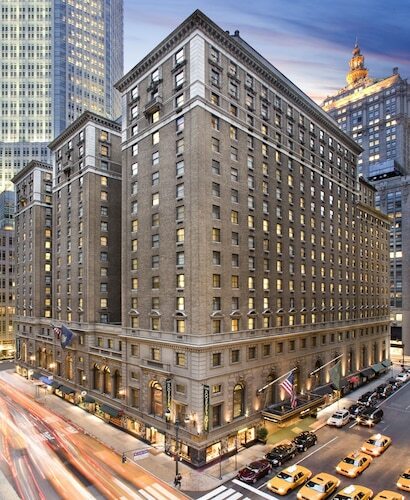 The Trump International Hotel & Tower New York and also the The Plaza Hotel are both within easy walking distance of the Macy's, while the Hotel Wales and The Lucerne Hotel are situated near the Columbia University. The Radio City Music Hall, another popular New York attraction, is walking distance from the The Lowell and the Four Seasons Hotel New York. 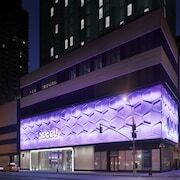 Hotels near the New York University include the The Chatwal, a Luxury Collection Hotel, New York City as well as the Gramercy Park Hotel. LaGuardia Airport is a nearby airport for flying into and leaving New York. It is 10 kilometres (6 miles) away. 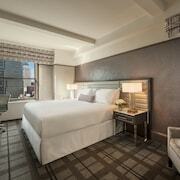 If you would like to stay nearby, try the New York LaGuardia Airport Marriott or Courtyard New York LaGuardia Airport. Once you’re all checked in to your hotel, it’s time to explore. Put your adventure cap on and see what the city has to offer! From good eats to thrilling excursions, there are tons of things to do in New York, and you can book them all right here on Expedia. 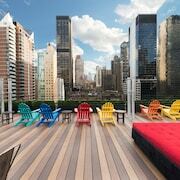 Explore New York with Expedia.ca’s Travel Guides to find the best flights, cars, holiday packages and more!